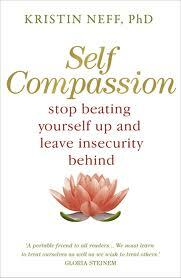 Self-Compassion is not a skill natural to most people, as we tend to be better at negative self talk. If Self-Compassion is low or non-existent then getting through any difficult times of the month can be very challenging, but by introducing self-compassion then those challenging times can become just that little bit easier, as you will be providing yourself with the support needed rather than just constantly attacking yourself with negative talk! – If we cannot be compassionate with ourselves at difficult times of the month then who will be? – Would you talk to a friend using the same words and tone, as you do with yourself when you make a mistake? So as the book suggests, make self-compassion a new habit… use words that support and comfort you, not ones that would make your best friend cry!